Ten thousand toe-smashing steps over loose gravel and unstable boulders swatting at swarming mosquitoes and wondering again and again how much farther, it still was not until 4 miles into a 5 miles crawl down the Lake Como access road that my mind flirted with regret. Such was the magnificence of Lake Como and the surrounding Little Bear, Blanca, and Ellingswood peaks. It was a great trip. 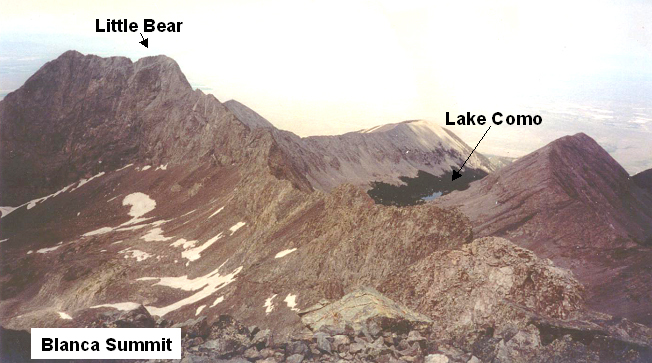 I left Boulder at 3:30am on 7/13/03 with a 3 day plan to bag Little Bear, Blanca, and Ellingswood, and headed toward Golden and C-470 that I took to I-25 toward Pueblo. I exited on hwy 160 toward Fort Garland. After passing beneath the Sierra Blanca Massif, I took hwy 150 to the unmarked road leading to the Lake Como trailhead. It was a nice and short approach to the passenger car parking. My plan was for 3 days with a option to bag Little Bear on day 1 (and save a day) if the weather held. As I arrived, the weather was promising, and I was of two minds: (1) I wanted to do Little Bear before dark, but, (2) I was worried about the harsh road and destroying my only ride home (Boulder is a long walk). I decided that discretion is the better part of valour and parked at the initial trailhead. Either the good weather would last long enough or I would do my 3-day plan. I started hiking with my massive pack at 8am. Almost immediately, I was sorry I had parked so low. I hate avoiding exercise for the sake of laziness, but I needed the extra time that parking at 10,000′ (instead of 8,000′) would have provided. The road and availability of parking was good enough up to that elevation. My five mile trek to Lake Como took a long time. I was pushing as hard as I could to save daylight, and getting more and more frustrated with my parking mistake. My attitude improved immediately when I came upon on of the most beautiful mountain lake settings I have ever seen. Lake Como is spectacular. The trees are thick and massive, even at 11,750; I suppose the protection of the Massif on three sides plus the constant availability of water must allow for unusual growth. The second thing I noticed was the mosquitoes. Oh why didn’t someone stop the insanity of the mosquitoes? I am from Florida and I know mosquitoes. These were bad mosquitoes and I didn’t have repellant. Rather, my sweaty clothes acted as an attractant…like I sprayed a can of “On” all over myself. A swarm of mosquitoes and I arrived at my creekside campsite at 12pm and the group of us (mosquitoes and I) took an hour to build my camp. The long setup time was caused by the extra activities required to co-exist with thousands of mosquitoes while building a camp. Take out the tent poles…. swat, spin, dance, take out the tent foot print, … swat, spin, dance, etc. The weather still looked good at 1pm and I started up thinking I’d turnaround if the weather turned on me. The approach gully (directly east of Lake Como) was a steep and loose scree and dirt slope that barely tolerated human presence. I finally topped out of the gully at 2pm and then became a bit confused about the way to the Hourglass. The proper course is to stay on the ridge following nice, easy trails to the top of point 12,980 (which lies in a direct line between the top of the gully and the summit of Little Bear). I misunderstood the route directions to mean I should look for a trail lower and followed a friendly-looking false trail heading that way. As I was wandering up and down the east side of Little Bear’s south ridge looking for the trail, I was thinking that I hate directions given in linear form, e.g., do 1, then 2, then 3; and that I much prefer a pyramid structure where by the entire picture is given briefly followed by more detail of the picture already described, e.g., the South ridge leads directly to the Little Bear summit, between the top of your ascent gully (12,500) and the Little Bear summit is Point 12,980. Stay on the ridge to reach Point 12,980 and then drop down on an established trail below the ridge to reach the bottom of the Hourglass which you will ascend to the summit. After an extra bit of time on the traverse (about 1 hour extra), I came to the bottom of the hourglass around 4pm. Since I was alone on Little Bear I didn’t have to worry about the major worrisome aspect of this climb…rockfall. The rock was dry and so after a short break, I scampered right up the middle without any problem. I climbed past a rope that was hanging from a dubious anchor and I feared for those who trusted it blindly. I continued upward to the summit that I reached at 5pm. The weather was still great, but now I had to worry about getting down before dark. I followed a trail down that took me to the far right edge (left side of the hourglass looking up) that seemed much easier than the path straight up the gully. I angled back to the center of the hourglass at the level of the anchors (by the way, there is an excellent piton anchor a few feet higher than the poor anchor so no hardware is necessary if a rappel is needed). I then walked down the center to the base of the Hourglass where I collected my stashed gear. On the way back, I was following the excellent trail below the ridge heading toward Point 12,980 when the weather turned on me. It happened fast. The flash-bang separation was small enough not to count. I was moving fast when I came to what I thought was the gully I used to climb to the ridge. Since I had been too low on the approach, I didn’t have any memory of the terrain. Anxious to get low, I started down. Fortunately, I realized my mistake before descending past the point of no return and continued until I reached the proper gully above Lake Como. At that point the sky cleared. Still, working my way down the loose gully was the worst part of the climb. Once I got close to the wooded area, I prepared for the mosquito onslaught by putting on all my clothes, e.g., long pants, rain jacket with hood up, hat pulled down low. Back at camp at 8pm, I refilled my water bottles, collected a few bars from my food bag and dived into the tent. I had just enough daylight to crush the life out of the few foolish mosquitoes that dared enter my tent with me. I tried to drink a lot of water to fend off cramps, but I just could not do it and fell asleep to the sounds of a bubbling brook by 9pm. About 5:50am I woke up feeling great. It was one of my best nights sleep ever and I am a connoisseur of sleep. I organized myself for the attempt on Blanca and Ellingswood via the ridge traverse and was on the trail by 6:30am. The trail to the basin was excellent and I followed it all the way in without incident. I could not decide which direction to do the ridge, i.e., Blanca to Ellingswood or Ellingswood to Blanca, so I kept moving forward and looking and thinking. Eventually it seemed the easiest path would be to go straight to the ridge and then use the ridge in both directions. Once I reached the ridge I could see the area very clearly….it was an impressive view of both the Massif, the Lake Como area and the Huerfano Valley area. I could see the entire route I took on Mt. Lindsey the week before and I could see the Gash ridge route that looked so interesting from the trail to Mt. Lindsey and I could see my routes to Blanca and Ellingswood. The ridge up to Blanca looked terrible (read: very steep) from my perspective so I decided to head over to Ellingswood first. I stayed on the ridge for a while until I came to a big notch in the ridge that looked impossible to down climb, so I worked down from the ridge to where I could enter the gully. I then scrambled up the gully to the notch and continued the rest of the way on the ridge to Ellingswood summit. I reached the summit at 10am and tried to enjoy a break and a snack but the mosquitoes had followed me to the heavens. And these were no angelic mosquitoes. After a quick bite and killing a few dozen mosquitoes, I headed back down the ridge. This time I was determined to stay on the ridge the entire way. When I got back to the notch that defeated me earlier, I spied a short route on the far side of the notch that looked like it might go. So I down climbed into the notch and took a line that started about 5 feet from the edge toward the Blanca basin and worked up and right at a 45 degree angle over a few loose blocks to climb out of the gully about 10-15 feet below the ridge line above the notch. I moved back to the ridge and stayed on the ridge all the way to Blanca. Apparently, my earlier views of Blanca were foreshortened; the angle was not bad and the climbing was mostly hands-free. 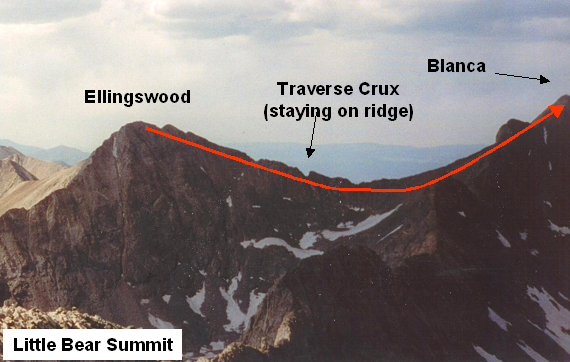 I reached the summit of Blanca at 11:30am and studied the traverse from Little Bear while swatting more bugs. I was very tired at this point having climbed over 9,300 feet in the last 28 hours, so I thought I’d rest a bit before pounding back to camp. While resting I began to think about my mosquito strategy. In a flash of insight, it seemed strange to me that when I see a mosquito, I wait for it to land so I can smash it. Nobody ever did this with a wasp or bee, so why a mosquito? Oh sure, it feels great to kill a mosquito, but I’ve noticed that it never does any good in an open environment. Now, if I kill the only mosquito in my tent, then I have no mosquitoes in my tent; this is a good thing. But if I kill a mosquito outside, a million more take its place without any notice that I have killed a cousin. I’d have to destroy the planet to get rid of enough mosquitoes to make a difference, so I decided to henceforth employ a “no land” strategy and do without the pleasure of killing the little bastards. The scree field below Blanca reminded me of the Little Bear approach gully (not hourglass) and I wanted no part of it. I decided to return down the ridge to just above the saddle where a trail intersects the ridge. Leaving the summit at 12pm, I followed this trail down to camp, which I reached at 1:30pm. Once again trying to pack and dance simultaneously, I gathered my belongings and took off down the trail to the car by around 2pm. Within 30 minutes of my departure, the skies opened up and it poured a mixture of rain and snow for about 30 minutes in a strange localized burst just over the Sierra Blanca Massif. I actually enjoyed the cooling rain (no lightning) and was quite pleased with my trip, but knew I had to get down to the car…something about counting chickens popped into my head. After over 3 hours of blister-forming, ankle-turning, knee-wrecking hiking, I could finally see my car and knew it was nearly over, and then I felt great all over again. Changed my plan for a 3 day trip without really thinking about it…just kept going (narrow situation framing trap).